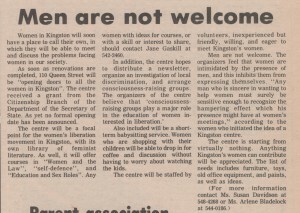 From the early 1970s to the early 1980s, since they had no organization specifically catering to them, Kingston lesbian feminists found a home at the Kingston Women’s Centre at 110 Queen Street. The Women’s Centre arose out of the efforts of a few women at Queen’s University who solicited funding from the Secretary of State to establish a home for Kingston’s burgeoning feminist movement. At the centre, Kingston women organized workshops and talks on women’s health, sexuality, reproduction, their position in the paid workforce and in the home, and on violence against women and family issues. The centre also hosted some consciousness-raising (CR) groups whose purpose was to help women come first to a recognition of the complexities of their second-class status and then to an understanding of how they could use this awareness to change their own lives and the larger society. 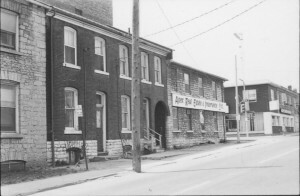 In the 1970s, the Kingston Women’s Centre was a site of vibrant debate, and the role of lesbians in the collective was a topic that stimulated much discussion. However, according to lesbian narrators, the relationship between heterosexual and lesbian feminists was neither one of animosity nor of complete ease. Although straight women involved with the centre could be homophobic, there really were not enough lesbian feminists at that time to sustain a separate community. Instead, Kingston lesbian feminists were fairly content to focus their political energy on “women’s issues” while exploring their sexuality through friendships and intimate relationships. In addition to the support and excitement generated from having a network of other lesbians with whom to explore sexuality, many women were satisfied with the women’s centre because they did not want to be publicly political about their desire–identifying as a feminist was risky enough. In addition, many lesbians were coming out of marriages and had family commitments that kept them vulnerable. The risks for these women were very real; in some cases women lost their children to ex-husbands who threatened to expose their sexuality if these women did not give their husbands custody of the kids. The feminist activities of the ’70s were a precursor to the explosion of feminist and lesbian-feminist community-building that characterized Kingston in the 1980s. The ’80s heralded a dynamic growth in the number of women-only services and cultural institutions. Feminist responses to violence against women took the form of the Sexual Assault Centre and shelters for battered women. An increasing number of straight feminists came out as lesbians and collectively established expressions of womyn’s culture such as Red Emma’s, a women’s-only café; Mrs. Dalloway’s, a women’s bookstore; and GAIA, a women’s music festival. To some extent this feverish activity grew out of lesbians’ recognition that it was difficult to meet other women and sustain community. Other than the Women’s Centre or sports, there were few public spaces these women could call home.